Melt the butter on low heat in a pot on the stove. Add the marshmallows and stir until completely melted. Stir in the crispy rice cereal. Grease hands with butter and form pandas out of the crispy rice treats. Cut eyes, a nose, feet, ears, and one long strip for the arms (you'll want to double up your Fruit Roll-Ups™ for the ears so they stand up better). Then stick the body parts onto each panda. 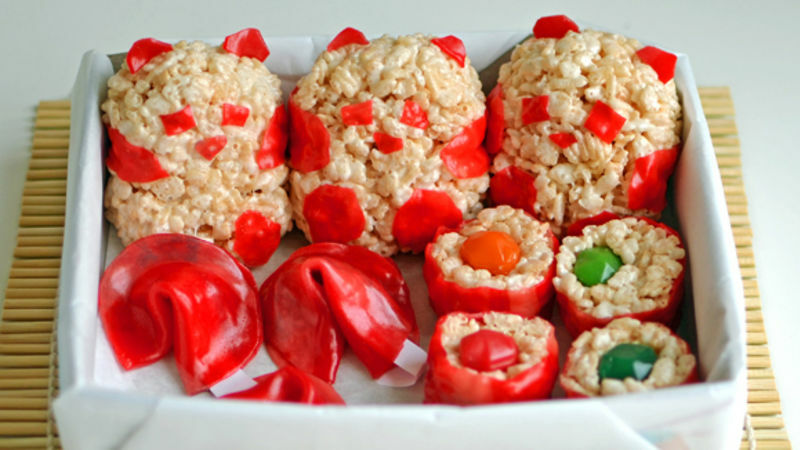 For the sushi, place some of the crispy rice treats on each Fruit Roll-Ups™. Roll them into a log and slice into desired size for sushi. Place a Gushers™ in each one. For the fortune cookies, layer four Fruit Roll-Ups™ and cut them into a circle. Put a fortune in and then pinch it into a fortune cookie shape. Hello Tablespooners! Yammie from Yammie’s Noshery here. I’m new around these parts so bear with me if I seem a little wet behind the ears (um… ew. Sorry for that horrifying image). Anywho, today we’re going to make a Candy Bento Box, which is pretty much a Japanese lunchbox. Only lunch is boring, so instead we’re making a sweet version out of Fruit Roll-ups and Gushers. Which, if you ask me, can still count as lunch if you want. I don't judge. Make a batch of crispy rice treats. We’ll start out making some cute little pandas. Make sure you grease up your hands with some butter or oil before you form them, or else you’ll be a big sticky mess. And yes, I do speak from experience. Next, you’re going to cut up some Fruit Roll-ups. You’ll need two eyes, a nose, feet, ears, and one long strip for the arms. They stick on pretty easily, just like stickers. So once your pandas are done, you can make some sushi. Check out the original Fruit Sushi recipe. Just place a glob of the cereal mixture on a Fruit Roll-up and roll and slice it, just like real sushi. Then you can put a Gusher on the top. Funny story about Gushers. Remember those old commercials where those kids would eat a Gusher and their heads would turn into a giant fruit? Well, when my sister and I finally had Gushers for the first time, we were way too freaked out to try them. I mean, I loved my little four-year-old head. Why would I want to trade it for a giant watermelon? However, after much deliberation, I chose the flavor that I would like my head to represent for all my remaining days and plopped it in my mouth. I have learned from the experience that the commercial was only a prime example of some superb 90’s animation and no real children were disfigured in the making of it. But, moving along… You should also make some fortune cookies. They’re super easy. These cuties are inspired by SheKnows, get the step-by-step instructions here. You just layer up and few more Fruit-Roll-ups, cut them into a circle, throw in a fortune, and pinch in together into a fortune cookie shape. Now all you need is a box. I actually just cut one side off of the Fruit Roll-up box and then wrapped it up in some parchment paper to make it look fancy and place your pandas, fortune cookies and sushi. Interested in assembling more Bento Boxes? Try these!